Swami Vivekananda was nothing if not decisive. When invited to make the journey to Chicago to attend the Parliament of Religions, however, the wandering sadhu and heir to Sri Ramakrishna wavered. How could he go? His master had relentlessly driven home the message of renunciation. A true aspirant was to shun the world, shun women and gold, shun fame and philanthropy. For six years after Thakur’s death, that’s exactly what Swamiji had done -- and yet. Accepting the trip to America felt right. Finding himself on the southern coast of India at the time, Naren decided to swim out to a nearby rock and meditate. ("Vivekananda Rock" as it is known and appears today is pictured above.) Afterwards, mustering the kind of self-confidence that his brother disciples were not yet capable of, Swami Vivekananda accepted the invitation and opened the West to yoga. Now, more than a century later, it is time for Sri Chinmoy’s disciples to take up the mantle of Swamiji’s boldness. In this respect, I have three broad hopes for the Center as it moves forward without Guru's direct leadership. First, that the Center adopt a bold mission of selfless service to the wider world. Second, that it provide long-term health care to those hundreds of disciples who have given their lives to Guru and now find themselves without health insurance and growing older. Third, and finally, that the Center operate with complete transparency. Years ago, my brother Jeevan said something to me in the frank manner for which he is known. We were talking about the Center and I had mentioned to him something I had read. To honor a recent accomplishment of Guru's, a group of disciples had made 27,000 snowballs. "They should have collected 27,000 blankets for the homeless," Jeevan noted dryly. While such childlike tributes served a purpose while Guru lived, their time has now passed. Now is the time for the Center as an organization to commit itself to selfless service to humanity -- locally, nationally, and internationally. I'm sure this suggestion may meet with some resistance. Guru wasn't particularly enthusiastic about philanthropy. The same was true of Sri Ramakrishna. Only after Thakur passed away did his disciples embrace service to the world, and then only with the bold leadership of Swamiji (Vivekananda) and Maharaj (Brahmananda). At the time, a number of Sri Ramakrishna's other direct disciples weren't so keen on the idea. Thankfully, Swami Vivekananda's spirit prevailed. In the years following, when cholera broke out somewhere, the second generation of the Ramakrishna Order -- the ochre-clad disciples of Swamiji and Maharaj -- were some of the very first headed into the afflicted villages (while most other people wanted out of such villages). Swami Vivekananda and his brothers knew instinctively that if Ramakrishna's disciples weren't brave enough to face such troubles, then nobody would be. Aren't Sri Chinmoy's disciples cast from the same mold? I will go so far as to say, however, that the Center is uniquely qualified to engage in such activity. It has worldwide reach, enthusiastic manpower, and know-how. From successfully planning and staging the World Harmony Run to putting on multi-day endurance events, to astounding feats of individual endurance and perseverance, it's difficult to imagine any other single group of individuals more fit to serve the world. My second hope for the Center is that it take care of its own, that it provide comprehensive health care to all those disciples who have given their lives to Guru for any appreciable amount of time and now find themselves without health insurance. I would hazard that there are probably less than a few hundred of these, maybe far less. Most such disciples probably live in the United States, which doesn't take care of its citizens' health care needs in the same way that other, more civilized, nations do. Nevertheless, not even a single disciple who has given their life to Guru should suffer in old age. My dear friend Sudhir was lucky. He worked for Victory-Factory, one of the few disciple-run businesses that provided such benefits to its employees. Even so, in the end, an inordinate amount of Sudhir's care fell to former disciples. (I shudder to think how Sudhir might have suffered without the constant love, devotion and sacrifice shown by Samarpana and Harsha.) I fear not all disciples will be so lucky. The Center should begin to address this issue immediately. My final hope -- and probably the most important -- is that the Center operate with absolute transparency. As someone who is regularly brought in in my professional capacity to sort things out (when it is way too late), I can't stress enough how important transparency is for the long-term health of any organization. Despite its fundamental importance, I suspect this will be the biggest challenge for those currently making decisions about the Center's future direction. I'm not being critical -- it's only natural. At issue is control of the future of an organization that was (and is) the life blood of hundreds, if not thousands, of disciples. Nevertheless, attention must be paid to the seemingly mundane issues of organization and management if the Center is to fulfill the legacy Guru has left it. It is in dealing with these issues that a spirit of openness and transparency are so important. Apparently, the Center's official name is the Sri Chinmoy Society, Inc., according to its corporate not-for-profit listing with the New York Secretary of State. When it comes to corporate entities, transparency starts with understanding how such organizations work. I'm no expert on such things -- and I'm not a New York lawyer -- but here's a primer on how such organizations work generally. Corporations are controlled by their owners. While the owners of a for-profit company are usually its shareholders, the owners of a not-for-profit company are typically its members. In this case, that probably means the disciples. Ownership is exercised in a representative way, much like a representative democracy. Having a thousand decision makers, for example, would make the act of governance impossible, so the members instead elect representatives. Those representatives are usually called directors and, once elected, they make up the Board of Directors. The board -- typically made up of an odd number of directors -- make all of the most important decisions about the not-for-profit company by voting (hence the odd number of directors, which prevents a tie vote or "deadlock"). To manage the organization on a day-to-day basis, the Board of Directors often hires officers, like a president or general manager, a secretary, a treasurer, and others as needed. At the best run organizations, the Board of Directors make such decisions at regularly scheduled board meetings, which are open to all members to observe. Records of such meetings ("minutes") are kept of exactly what took place and are then distributed to the organization's entire membership (oftentimes through a newsletter or member website). The rules of the road for any particular organization are usually called the by-laws. Organizations must generally make the by-laws (and other corporate records) available to all members upon request. The by-laws are critical. They identify, among many other things, how members become members, when and how often elections are to be held to choose the directors, how many directors there are to be, how often the board meets, and all of the other procedural details necessary to organize and run the corporate entity. It is when the by-laws are not followed -- when those who are in de facto control of an organization and don't want to lose such control -- that trouble typically arises. Transparency -- openness about both the organization's assets and management -- is the preventative vaccine for such problems. Without a basic understanding of how the corporate entity is organized and the rules by which it is managed, the individual member-owners lose control. I'm no longer privy to what goes on in the Center, but as a well-wisher, I worry about the apparent lack of transparency since Guru's death almost a year and a half ago. It's just little things. Like the fact that the only public account of Guru's passing is my recollection of Sahishnu's account. As a blogger, I'm thrilled. It drives traffic to this site. But it's sad, really. Then there is the fact that Guru's will -- a document publicly filed in the Queens County Probate Court (but not so easily obtained) -- is only available on an anti-cult website. There's no good excuse for this. Certainly, Guru's passing was a cause for great mourning. And I can understand how some people might genuinely feel that it's morbid to want to think about such things -- that it's better to keep such things away from view. Understandable, but wrong. It's difficult to deal with the death of a loved one, but the difficulties are multiplied if not addressed in a straightforward and professional way. It's time for all disciples to take up the reins of the organization and steer it into the future. One good example of transparency is that provided by the Gangaji Foundation. I don't know much about the group, but its leader -- Gangaji -- is a female teacher based in Oregon. She has a no-nonsense vibe and what I really like is that she posts, among other things, her foundation's financial reports online for public consumption (and here's their board ... nicely done). It's a great start and something I hope the Center emulates and improves upon. Finally, more broadly, I hope that the Center takes a modern attitude towards control -- more new Google than old IBM, more strength in numbers and diversity, than top-down authority, more Barack Obama than George W. Bush. It must be an exciting time to be a disciple. The opportunities are endless. I wish them all the best and can't wait to read their own memoirs in the near future. Update (September 20, 2009): Just stumbled upon a great letter from Swami Vivekananda to his brother disciples. Writing from England in April 1896, Swamiji outlines the organizational structure of the Ramakrishna Math. Amazing that more than a hundred years later -- with a few tweaks here and there -- Swamiji's outline could still serve as a model for organizing today's Sri Chinmoy Center. 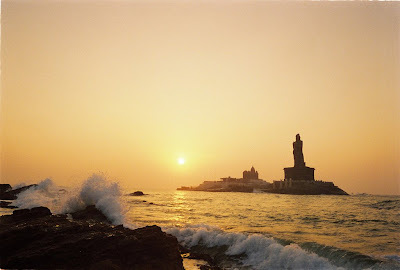 Credit for the beautiful photo of Vivekananda Rock on the coast of Kanyakumari goes to indian~man on Flickr. Couldn't agree more - lots of great ideas! Thanks for reading and for the kind words, guys.